For those who like a ribbon-based tweeter, PreSonus’ stylish monitors offer an alternative to the usual suspects. We looked at the PreSonus Eris MTM active monitors back in the September 2016 issue, however they weren’t the only new active monitors to be launched by the company around that time. The R series, the subject of this review, appeared all but simultaneously. 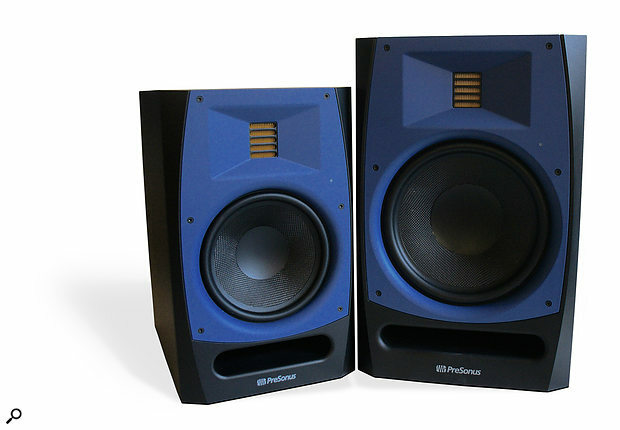 Despite their competitive pricing, the Eris MTM monitors achieved a pretty reasonable level of performance, and their mid-tweeter-mid format offered some useful installation versatility. So it will be interesting to see if the R Series monitors comprise a similarly rounded and attractive package. The R series consists of two models: the R65 and R80. Although more expensive than their Eris MTM siblings, they both still sit not far above what I would consider to be the entry-level price bracket for active monitoring. 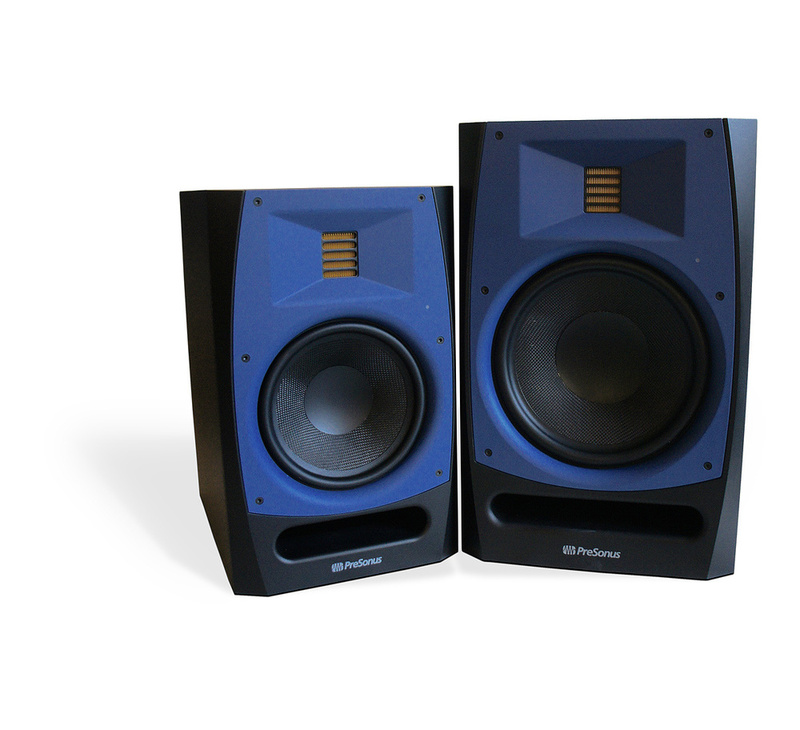 At first glance, the two R Series monitors differ only in terms of enclosure size and bass/mid driver diameter (and consequently in low-frequency bandwidth and maximum volume level), but it may well be that other, more subtle differences become apparent as I investigate them further. Interestingly, the R series appears to have little in common with the Eris MTM series and, as such, I find it slightly odd that there doesn’t appear to be a single overall design philosophy informing all PreSonus monitors, but this clearly need not be an issue in terms of any particular monitor. Perhaps the most notable element of the R series, apart from their optional, and attractive, blue front trim panels (alternative black front trim panels are included with each speaker), is their use of a ribbon-type HF driver. In principle, the component parts of a ribbon driver are not unrelated to those found in a ribbon microphone. A thin conductive diaphragm, the ribbon, is suspended between the poles of a magnet. In a ribbon mic, when the diaphragm moves in response to passing acoustic energy, a small current is generated and passed to the output terminals via a buffering preamp or transformer. A ribbon driver effectively works in the reverse manner. The audio signal is routed through the diaphragm, and thanks to its immersion in a magnetic field the diaphragm moves in response. 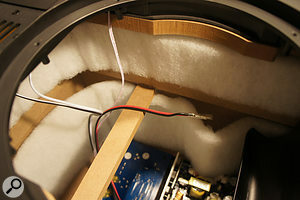 The often-argued advantages of ribbon HF drivers over the much more common moving-coil dome devices (which are of course broadly analogous to moving-coil microphones) are simplicity, lower diaphragm mass, much lower (and more effectively damped) fundamental resonance and, significantly, that the ribbon diaphragm is driven over its entire area rather than just radially, as is the case with dome drivers. This last advantage means that ribbon diaphragms are, in principle, less prone to mechanical resonance. There’s none of the resonant ‘break-up’ that occurs when dome diaphragms are working at the higher end of their frequency range, as movement at the apex of the dome begins to lag the periphery. Ribbon tweeter.Along with the advantages, of course, are some disadvantages. The most significant of these is probably the inherently low sensitivity of ribbon drivers and therefore their somewhat limited maximum output level for a given diaphragm size. The relatively high mass of a dome HF driver voice coil provides a significant degree of heatsinking, so high levels of electric current can be pushed through. In contrast, the lower mass of metallic conductor used in a ribbon diaphragm means there’s little thermal capacity to handle the heat. The ribbon diaphragm area can be enlarged, which increases the thermal mass, but doing so unavoidably limits the acoustic dispersion of the diaphragm as its size begins to approach the wavelength of the radiated audio. The solution to this fundamental ribbon HF driver problem, and the one now employed in the majority of such drivers, was developed by a fascinating German engineer called Oskar Heil (see box). Heil’s solution was to fold the diaphragm, giving it pleats rather like those of accordion bellows, so that its effective diaphragm dimensions in terms of acoustic dispersion become somewhat disconnected from its effective radiating area in terms of sensitivity and maximum level. 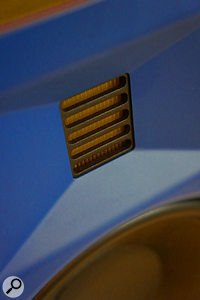 Heil’s idea became known as the ‘Air Motion Transformer’, reflecting the analogy between the voltage-multiplying effect of transformer windings and the area-multiplying effect of pleats in the diaphragm. So, with a pleated diaphragm, the ribbon HF driver problem of level and sensitivity versus dispersion is overcome, but it’s really still a close run thing, and that is to some extent illustrated by the PreSonus monitors. The ribbon HF driver fitted to the R65 and R80 has rectangular proportions, being around 3.5cm wide and 4.5cm high. That difference in width and height means the driver’s horizontal and vertical acoustic dispersion will be different. The dispersion will begin to narrow more quickly vertically than horizontally with increasing frequency. 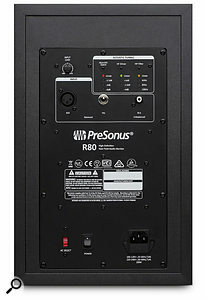 PreSonus present narrowing vertical dispersion as a good thing in the R Series promotional material, arguing that it means reflections from floor, ceiling and workstation desk are suppressed. Now, while I’m generally sympathetic to the idea, I’m not quite so convinced that the high-frequency dispersion narrowing of a ribbon driver is in that respect hugely significant. Narrower vertical dispersion through the mid-range is, I think, a more significant factor. Perhaps ironically, the last PreSonus monitors I reviewed, the D’Appolito-format Eris MTM series, demonstrated that phenomenon quite clearly. The R80’s measured frequency response (200Hz to 20kHz). The turquoise plot shows the on-axis response; the pink and blue show the response 20 degrees off axis horizontally and vertically, respectively. Enough of my musings on ribbon HF drivers, then, and back to the more prosaic elements of the R65 and R80. As we’ve all come to expect with active nearfield monitors, their rear panels are home to a connection, control and heatsink panel. The last function on that list, heatsinking, is made much easier by the use in the R series of Class-D power amplification technology, which is significantly more efficient than conventional Class-A/B topology. The amplifier ratings are 100W and 50W (LF and HF respectively) for both the R65 and R80. R Series signal connection options extend to balanced XLR and TRS jack, and unbalanced RCA phono, and control facilities include a variable gain knob (with, thankfully, a detent at 0dB), and some EQ options. The EQ options comprise ‘acoustic space’ compensation, low-frequency cutoff and HF level adjustment, and are selected and indicated by small push-switches and a matrix of LEDs. The acoustic space options comprise -1.5dB, -3dB and -6dB settings intended to provide some compensation for the influence of nearby room boundaries. The frequency at which the acoustic space compensation operates isn’t revealed in the specification, but from the quick FuzzMeasure investigation I carried out it appears to operate from around 1kHz downward. Such relatively primitive level adjustment can’t really offer perfect compensation for the influence of room boundaries, but it might nonetheless be useful in troublesome monitoring installations. The R Series LF adjustment, offering 24dB/octave 60Hz, 80Hz and 100Hz cutoff options, is primarily intended for when the monitors are used in conjunction with a subwoofer, however I can’t help feel that unless I was specifically mixing 5.1 material with an LFE channel I’d want to use the lowest possible subwoofer crossover frequency, namely the unfiltered LF roll-off of the monitors — specified at 45Hz for the R65 and 40Hz for the R80. The rear panel houses the input connectors, input gain knob, and acoustic correction controls.The HF EQ provides +1dB, flat, -1.5dB and -4dB options from 2kHz upwards. The 2kHz frequency suggests that the HF EQ is enabled simply by adjusting the overall gain of the HF power amplifier. There’s nothing fundamentally wrong with this in principle, of course, but it does result in decidedly broad-brush balance adjustment. If it seemed appropriate to attenuate the HF by as much as -4dB all the way from 2kHz upwards, I think I’d begin to wonder about the character of my listening environment or the inherent frequency response of my monitoring signal chain. 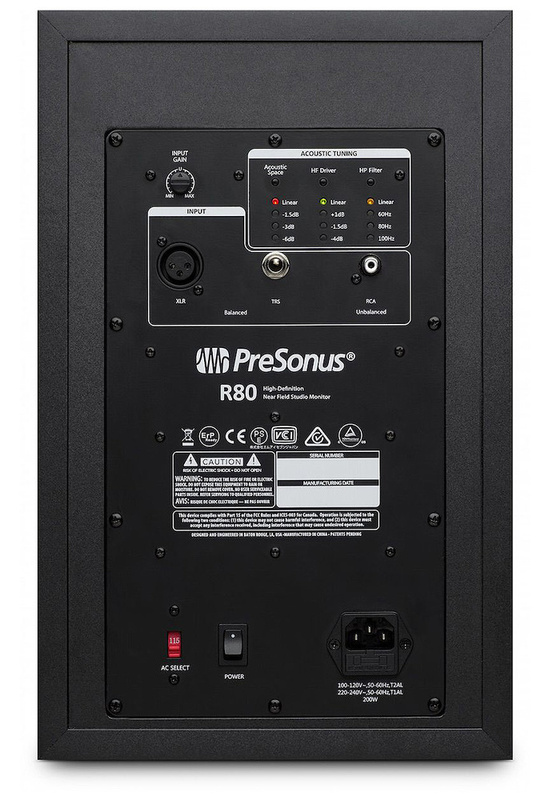 One respect in which the PreSonus R series and Eris MTM Series do appear to have something in common is that their R Series 6.5-inch and eight-inch bass/mid drivers use Kevlar diaphragms. Kevlar potentially offers a good compromise between mechanical rigidity, damping and mass, however no single material or mechanical feature ever offers a magic bullet in terms of driver performance. The performance of a driver is, quite literally, about the sum of its parts and how they are put together. And speaking of the parts, removing the blue trim panel from one of the monitors to see what’s involved (six screws, it’s easy) reveals that the R Series bass/mid drivers are built on a somewhat old-school-looking pressed-steel chassis. 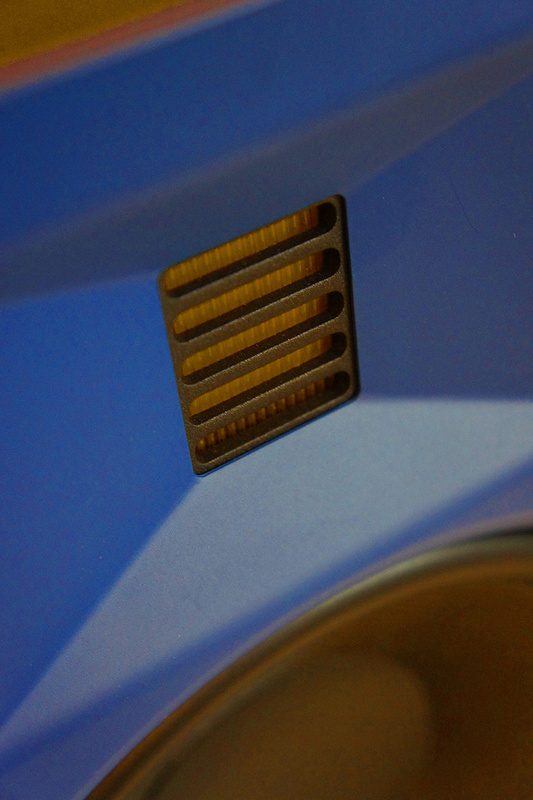 Pressed-steel chassis are generally less expensive than the die-cast items that are commonplace these days, and along with being less rigid, they do limit some driver design freedoms — the open area behind the diaphragm and voice-coil venting, for example. However, there have been numerous great monitors built over the years without the luxury of die-cast driver chassis, so the use of pressed steel needn’t necessarily be a negative, but it does perhaps reveal one point in the design process of the R series where the need to hit a price resulted in an engineering compromise. Firing up the R65 first to listen to some familiar material and mixes, the first thing I noticed was a little background hiss. It’s just on the wrong side of inaudible. Although the hiss is insignificant once music is playing, and the monitors are fitted with an optional auto-standby function that kicks-in after a while when the speakers are unused, it is a little distracting when the monitors are idling. Perhaps it’s a little unfair on nearfield monitors that, by definition, we listen so close, because it means they really do demand silent electronics. The second thing I noticed about the R65 was that the basic balance is on the bright side of neutral but that the ribbon HF driver is really pretty impressive — especially with a little attenuation from the EQ controls to tame its level. A good tweeter must be simultaneously detailed and explicit while at the same time not over-emphasising any particular region of the HF band or sounding unnatural. The R series pulls off that trick with distinction. It is particularly capable on delicate ride cymbals, for instance, revealing all the detail and colour but without any kind of unnatural emphasis. The tweeter’s character is reminiscent of the very similar-looking ribbon driver fitted to the Fluid Audio FPX7 that I reviewed back in the August 2016 issue, and I wonder if they are actually the same unit. I wouldn’t be at all surprised. So the R65 tweeter is a success and, moving down the audio band, while I was never quite as happy with the mid-range as I was by the high frequencies, it also has some positive qualities. It is revealing of mix elements and able to create some impressively focussed stereo imagery but is occasionally compromised by a slight nasal quality. It is the kind of character that, if you heard it from a mic on vocals or woodwind in a tracking session, you’d go and move the mic, or perhaps swap it for something else. I don’t think it’s a deal-breaker in terms of monitoring; many a monitor has its quirks (did somebody say NS10? ), but it’s something that would take a little learning. As to the cause? Well, despite its contemporary-looking Kevlar diaphragm (although Bowers & Wilkins introduced the first Kevlar speaker diaphragm in 1974), there’s no escaping my feeling that the R65 bass/mid driver is relatively unsophisticated and it may well be the source of the tonal character. Again moving down the audio band, the R65 low-frequency character, while unmistakably that of a reflex loaded speaker, particularly when driven relatively hard, is reasonably well controlled and vice-free. Not only did the PreSonus designers choose wisely not to be too greedy in terms of low-frequency bandwidth on the R65, they also gave the letter-box-stye reflex port generous exit and entrance flaring, which is good. Even so, a quick port-blocking experiment on the R65 left low-frequency mix elements easier to discriminate and therefore easier to balance, even though, with blocked ports, the LF bandwidth and level drops a little. So the R65 is, on the whole, a capable little monitor with a really good tweeter. But what about the R80? Generally, it will perhaps come as no surprise that listening to the R80 is not a hugely different experience — the two monitors are clearly related. The R80 tweeter appears to be identical and it displays the same set of positive qualities in the larger and more powerful monitor and, as with the R65, worked better for me when attenuated a little. But the R80 sounds bigger than the R65, with significantly more LF bandwidth and a sense that, even when playing reasonably loud, it’s really just idling. In volume level terms the R80 constitutes a lot of unflustered monitoring for the money. The R80’s internal cabinet bracing.Down in the mid-range, the mild nasal quality I heard on the R65 is less apparent, but that’s perhaps because I think the speaker has a slightly more significant character a little further down the band — in the 200 to 400 Hz octave where I’d expect any enclosure panel resonance to occur. A short paragraph of marketing copy on the side of the R80 packing box refers to “extensive cabinet bracing” but I’m not convinced said bracing has been entirely effective. The mid-range character was most noticeable initially on male voices; they gain a touch of unnatural-sounding warmth and body (again, you’d change or move the mic if you heard it while tracking), but as I listened further I began to notice its effect more widely. And where the mid-range stereo image on the R65 had good depth and focus, on the R80 it seemed a little flatter and more diffuse — a sign, in my experience, that cabinet panels are playing along with the music. As with the R65, the R80’s bass performance is nicely balanced without significant port-loading character, beyond the slight softening and overhang of LF transients that is all but unavoidable as soon as you choose reflex loading over a closed box. For me, however, the combination of that reflex-loaded character and the mid-range ‘bloom’ leaves the R80 a little compromised on material that demands real tonal accuracy in the upper bass and lower mid-range. If your work falls predominantly into, say, electronic music genres, these R80 misgivings will perhaps be insignificant and you’ll appreciate the monitor’s fine HF performance and ability to play clean and loud. But if your work falls more often into genres where tonal accuracy of voices and acoustic instruments is paramount, I think you might find the R80 a little frustrating. I’ve had the good fortune recently to listen to some extremely fine monitors in a similar market sector to the R65 and R80; I’m thinking of Pioneer’s RM series, and Dynaudio’s Lyd series in particular. So the R Series monitors have arrived at a time when the competition is particularly tough and, though they are capable and will get the job done, they aren’t quite as accomplished as the best I’ve heard at the same kind of price. I’ve already mentioned the Pioneer RM-05/07 and the Dynaudio Lyd series, but monitors in the same price range from manufacturers such as Adam, Genelec and Focal, to name but three, would also be worth considering. Oskar Heil, widely credited with coming up with the pleated-diaphragm ribbon driver, falls into the kind of ‘polymath’ category that is so much rarer in these days of niche expertise. Born in Germany in 1908, Heil grew up in an age of enormous scientific and engineering advances and he played a significant part in fields as diverse as maths, music, microwaves, electronics (including an early field-effect transistor patent), and biology. He and his Russian physicist wife worked in the UK during the 1930s but they left on the outbreak of the Second World War; she back to Russia, he back to Germany, where he worked in the field of microwave technology. After the war, Heil was among the German scientists and engineers invited to live and work in the US (Werner von Braun, designer of both Hitler’s V2 missile and NASA’s Saturn 5 rocket, is probably the best known of this group). Heil founded his own electronics company, Heil Scientific, in the US in 1963 and it was during this period that he developed his ideas for the eponymous Heil Air Motion Transformer tweeter. Heil died in 1994, and no, his wife Agnesa never did join him in the US. She remained in Russia until she died in 1991. R80 plays loud without getting flustered. Port-loaded bass is slightly compromised. The R Series’ genuinely classy high-frequency performance was for me a little let down by some mid-range coloration and slightly soft reflex-loaded bass. Others may still find the R Series exemplary, but I found they constitute a slightly frustrating mix of the great and the not entirely sorted. R65 £758, R80 £958. Prices are per pair, including VAT. R65 $799.90, R80 $999.90. Prices per pair.